Located along the Queen Elizabeth II Wing – Upper Hall, this space provides opportunities for local and provincial artisans to prominently display their works. This exhibit—which has featured everything from quilting and photography to sculptures— changes regularly. 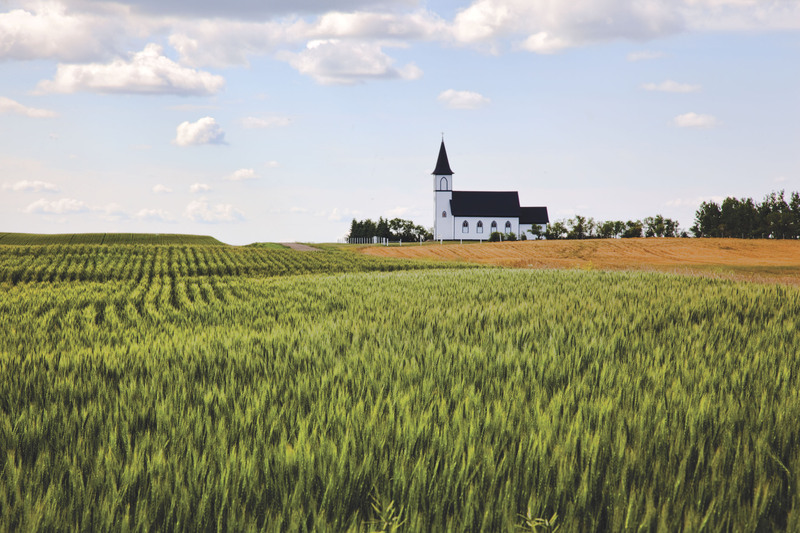 Legacy of Worship features photographs by Larry and Dorothy Easton and resulted in 'Legacy of Worship: Sacred Places in Rural Saskatchewan', a coffee-table book by Easton, writer Margaret Hryniuk, and archivist Frank Korvemaker. Larry has selected a number of images from the book to be featured in this exhibition. Since the 1970s, Larry Easton has been an active photographer. He has been a member of the Regina Photo Club for forty years. He is one of only two members of the Club to receive its Prestige Award for photographic achievement. He has received numerous competition awards and recognition for his photographic works. As well, his works have appeared in Prairies North and West World magazines, in projects for Saskatchewan Tourism and the Regina Chamber of Commerce, and in educational books. Lawrence Francis (Larry) Easton was born on the family farm near Wawota, Saskatchewan. Thanks to his mother's love of photography using her box camera, Larry began taking pictures during his university days in the '60s. He would develop film at an off-campus lab, at the back of a corner store. In 1964 he received his Electronic Engineering Technologist diploma from Saskatchewan Technical Institute, Moose Jaw. He was employed as an engineering manager with Sasktel in Regina until his retirement in 1993. Larry continues to work closely with the Regina Photo Club, organizing contests and exhibitions and sharing his experience with new members. This video, the fifth in a five-part series on the First World War, recalls the events of 1918, as seen by both those serving in war-torn Europe and on the home front here in Saskatchewan. The video features a rich selection of documentary material held by the Provincial Archives of Saskatchewan and its partners which relate to Saskatchewan’s involvement in the First World War. The video, along with the previous parts can be viewed online on the Provincial Archives of Saskatchewan’s YouTube channel. Also, be sure to visit their website for more information regarding this video series.